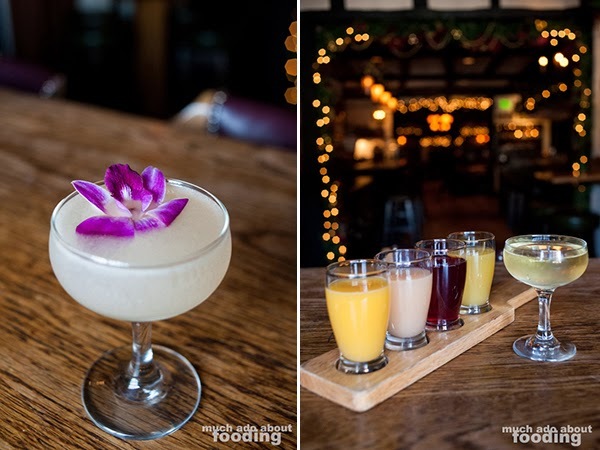 After finding ourselves a curb to park against on the narrow street alongside the restaurant, we walked up the quaint neighborhood sidewalk to sidle up along a stucco wall and find our way to SideDoor's entrance. Or at least, I believe it was the entrance we came to - a side door on a building only visible if you dared peek your head up an enclosed walkway. The overhead sign showcased the name of the restaurant with a key emblem, attached to the same building the houses Five Crowns. There isn't a door or wall that separates the two though, and it makes sense. They are both part of the Lawry's family of restaurants. 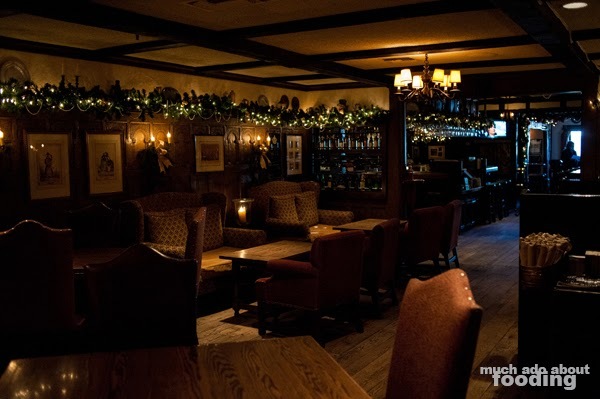 A spanning full bar greets us upon entry and looking around, we spotted the crackling fireplaces and cozy feel of the dining rooms. 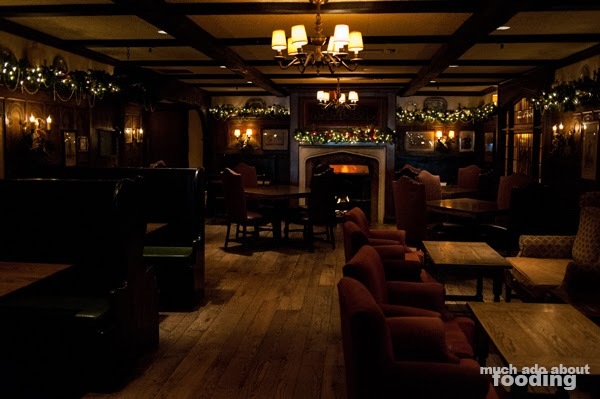 It almost seemed like a hunting lodge that others would relax in. Wooden furniture, plush chairs and dim lanterns - one could get used to it. We were there to check out their brunch and were glad to explore their menu with its rotating items. 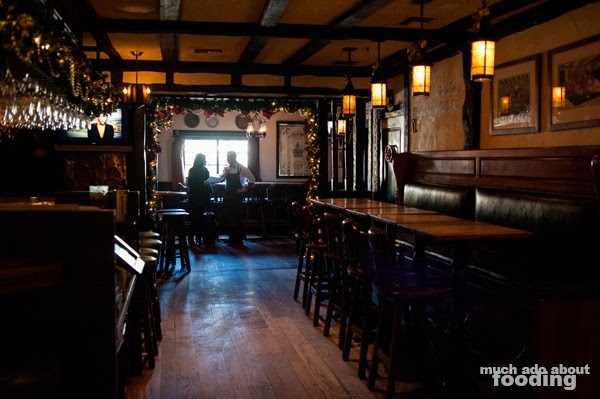 As aforementioned, their full bar is quite expansive and we were happy to see that their brunch menu was not composed of just the typical Bloody Mary and mimosas. 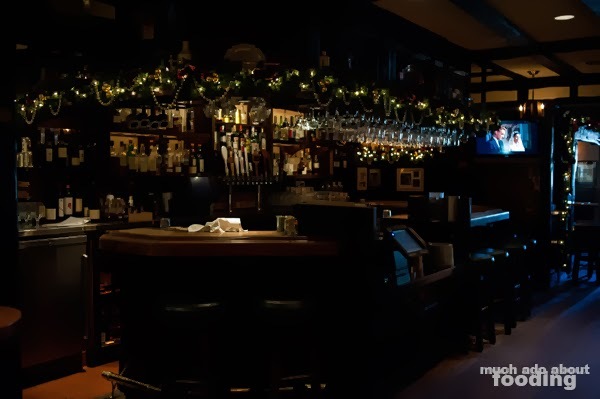 In fact, they happily encourage guests to opt for any of the craft beers, wines, or even the seasonal cocktails on hand. We were graciously guided that morning by one of their bartenders, Trevor Kawamoto, who was the visionary behind our one craft cocktail order - the Mexican 75 ($12 - Blanco tequila, grapefruit juice, peach bitters, champagne). Designed to be a tribute to the classic French 75 cocktail, this one was just as beautiful as it was tasty. Tequila being the spirit of choice was the inspiration for the name and the grapefruit juice made it an apt morning refresher. They do also have their SideDoor Bottomless Mimosa ($12 - Brut cava and flight of seasonal fruit juices) though so we had to cease any lamentation about that common brunch cocktail. It is a staple, I suppose. The juices that came with our flight that day were orange, grapefruit, cranberry, and pineapple. With a better-than-two-buck-chuck sparkling used for the base of the mimosa, SideDoor does seem to care despite it being bottomless, and the juices weren't bad either. Apparently the most popular is the cranberry juice which we tried and hey, it's pretty darn tasty. The menu itself was a nice balance of lunch and breakfast but we swung more on the savory breakfast item side given the morning hour. They mentioned that a summer menu addition happened to become very popular and had thus stayed on the menu since so we were curious about it. What was the dish? Just a Breakfast Burrito ($12 - bacon, eggs, hashbrowns, cheese, pasilla chili) done quite well. 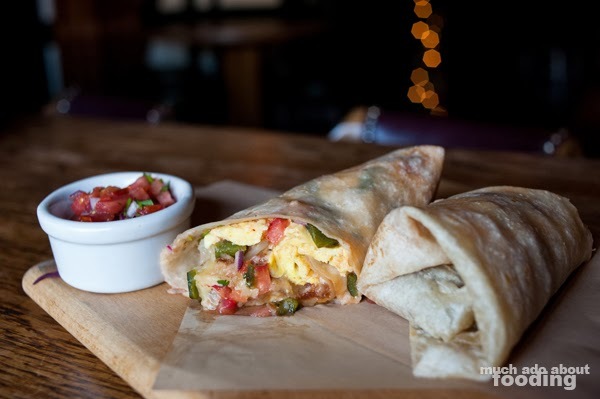 It made utter sense that it would be popular - what says Orange County better than a breakfast burrito? I think what I enjoyed most of it all was the fresh and bright pico de gallo both inside and out. 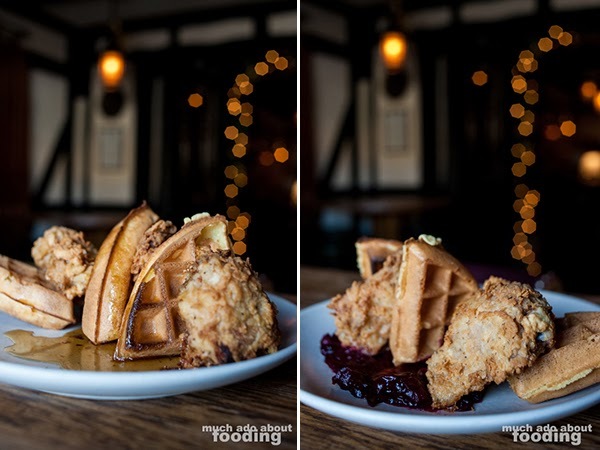 Obviously we could not not take a stab at their Fried Chicken & Buttermilk Waffles ($16 - maple syrup and cranberry compote) which came between two lakes of differing "sauces." Maple syrup on one side and cranberry compote on the other, the crunchy and salty chicken was tempted to fall either way, and the hefty waffles were to follow suit. I was surprised to see that these were whole pieces as well with bones aplenty. Keep that in mind if you opt for this dish! My favorite, however, of them all was the Green Eggs & Ham Benedict ($12 - with hash browns), a nostalgic dish that pulled forth memories of Dr. Seuss and using food dye in class. The green part came from a hollandaise sauce that had been tainted by the likes of parsley puree, and the ham was pretty much thinly sliced and oh-so-delightful prosciutto. We were both big fans of this one. 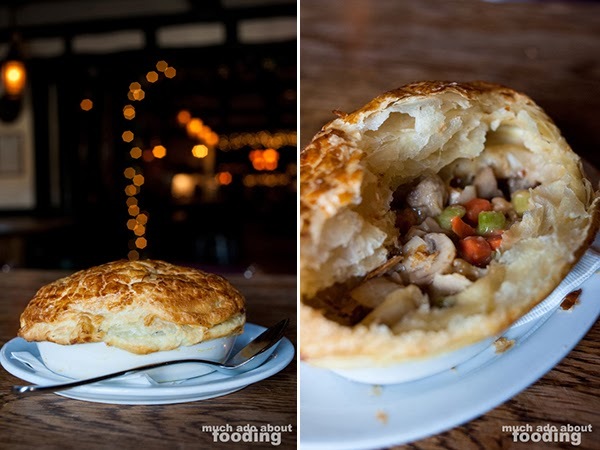 To follow the theme of the environment which was pretty much to stay cozy and homey, there was a Jidori Chicken Pot Pie ($12) on the menu that we had to give a try. This was not quite the kind of pot pie we were expecting however as it came with a very puffy crust that made a complete mess once we tried to dig into it. Even the filling did not contain the creamy richness to which we were accustomed but that is not to say it was without merit. Those who love lightly gravy-ed vegetables and chicken will enjoy this one. 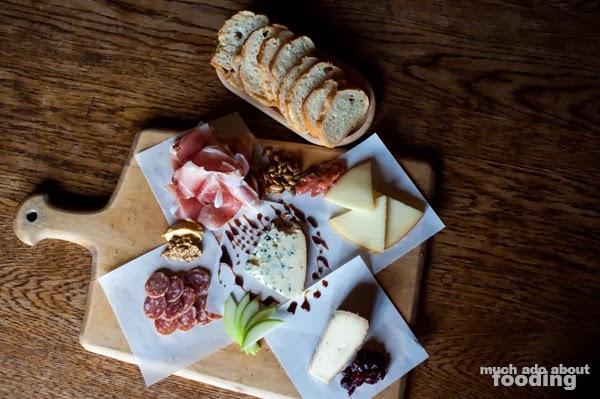 Lastly, we went for their charcuterie and cheese plates which are presented as Chef's Plate of 3 choices - $15 | SideDoor Sampler of 5 choices - $23. 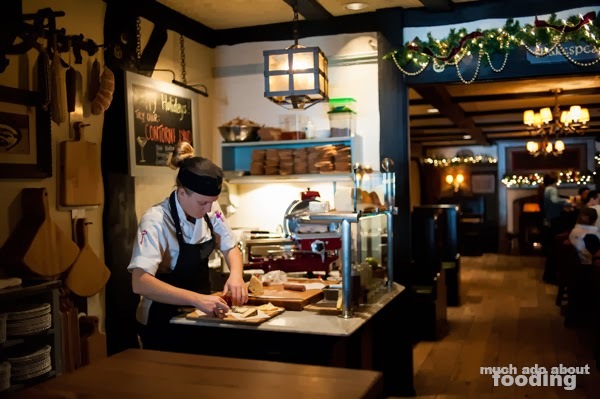 There is an inset booth of everything next to the kitchen service window that also had a staffed expert to educate inquiring guests. The selection rotates frequently and is handled with an industrial slicer. For our own board, our choices were the Baladin, Italy (notes of coffee & cocoa); Idiazabal, Spain (nutty, buttery, lightly smoked), Moody Blue, Wisconsin (smokey, hints of nuts); Loukanika, Oregon (orange zest, cumin); and Speck, Italy (creamy, lightly smoked). I'm not even sure how much I need to tell you we loved it all - take a look at the picture yourself. You'll need to get your hands on this one. Our thanks go out to Trevor and Adam for their guidance and service throughout this visit. SideDoor is located at 3801 E Coast Hwy, Corona del Mar, CA 92625 and is open for brunch on Sundays. Go early to avoid any parking craziness when it starts getting packed inside! 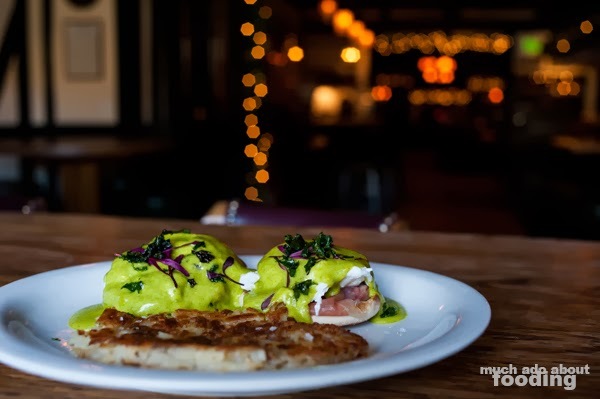 NOTE: This brunch article is a part of a series that we will be running through to April, the month when the full editorial will appear with a multitude of more articles and informational pieces in the Orange County edition of LOCALE Magazine. Make sure to check stands when the issue drops so you can get the full scoop on brunch in OC! I love this place! Thanks for the tip, will definitely check out their Sunday brunch! BTW, do you recommend a certain time to go to avoid the parking mess? Hey Sara, we have a giant parking lot and its free for brunch, so come on down!